Despite the fact that exercises with daggers have been mentioned in sources since the beginning of the 18th century, practices did not have the independent martial value and were part of wrestling. Nevertheless, the practice with daggers still exists and is used for the same purposes as the others – to acquire stepping and moving skills. 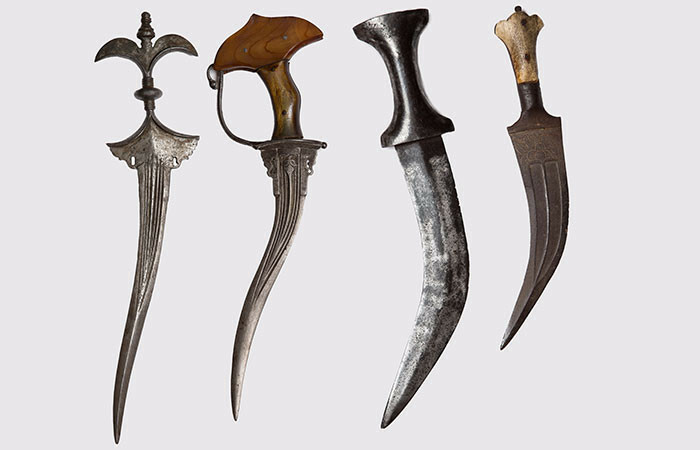 In Indian and Mughal traditions daggers as a rule were held with the blade pointing downward from the bottom of the fist. The basic principles are the same as for tulwar: a hand never unbends completely and all strikes are made at a circle trajectory. In case of the dagger it leads to rending, unripping strikes as if caused by animal’s claws that was very close to the Indian culture associating with the image of the tiger. So this technique was reflected in the names of weapons as different kinds of “claws” and “ teeth”. Such kinds of strikes were not supposed to be deadly. In the first place limbs were attacked, after that only wrestling decided the outcome of the fight, which finished with “coup de grace” with daggers. In fact there was no fencing with daggers. Like in all techniques every tactic action is done at the same time as the step and the shift of weight from one foot to the other. The protective actions in the cause of training represent movements striking away the armed enemy’s hand by the empty hand of the defender. In a real fight it may transform into a fierce attack to the armed enemy’s hand by the defenders dagger. But the main idea is to follow the basic principle of the “pentra” movments in any case.